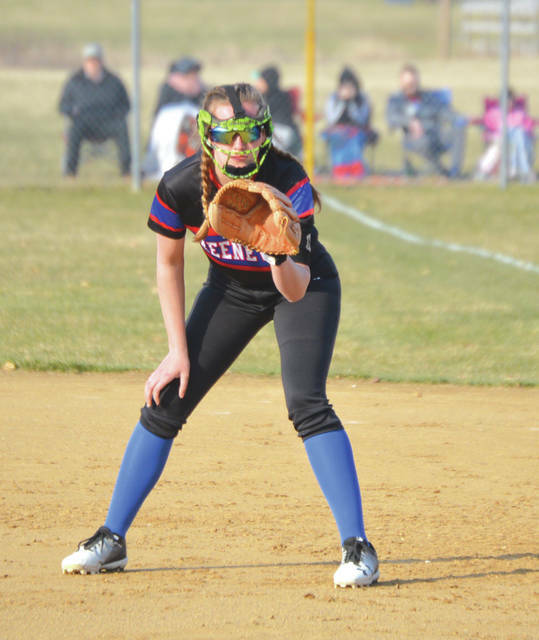 Greeneview pitcher Alexa Simpson struckout seven Cedarville batters, scattered seven hits and walked one Indian in the Rams 20-5 run-ruled win, March 28 in Jamestown. Cedarville outfielder Grace Jacobs chugs toward third base for a third-inning RBI triple, March 28 in a season opening loss at Greeneview. Brooklyn Fannin of Greeneview readies herself at first base, in the fourth inning of Thursday’s high school softball game with visiting Cedarville. 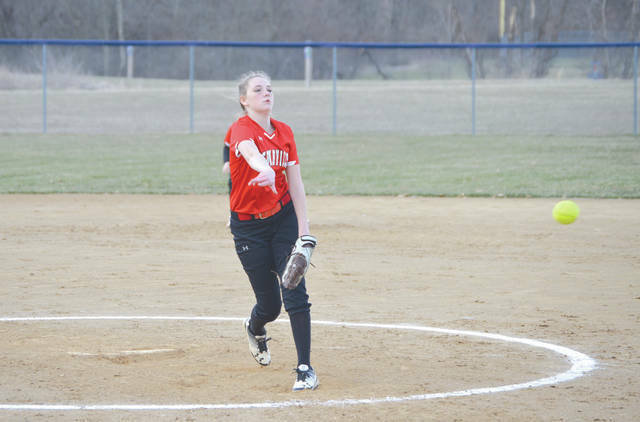 Cedarville’s Jade Herron pitched in relief against Greeneview, in a run-ruled loss March 28 in Jamestown. JAMESTOWN — In a game of many firsts, Greeneview claimed its first win of the season in its first home game of the season against Cedarville, a team playing its first game of the season. The Rams earned the win with solid pitching and plenty of hitting for a 20-5 run-ruled win at Greeneview High. Cedarville may have been the first team to grab a lead in the March 28 game, but it didn’t last very long. The Indians’ Lauren Whitaker and Grace Jacobs both scored on Regan Coffey’s single to right field. Greeneview (1-2, 1-0 Ohio Heritage Conference) responded with three runs of its own in the bottom of the first. Alexa Simpson tripled to score Bryce Ratliff and Kassidy Atkins, then Simpson scored on an infield groundout by Caitlyn Sweat for a 3-2 Rams lead. The visiting Indians (0-1, 0-1 OHC) were playing without one of their leading players, Kaylee Cyphers, who was playing in a Senior All-Star basketball game. Despite some first-game jitters and playing slightly shorthanded, Cedarville kept playing hard. The Indians added one run in the third inning on a Jacobs’ triple that brought home Sarah Sizer, and they whapped four hits in the fifth to score Sizer and Lauren Whitaker with runs, but by then Greeneview was waaay out in front. Greeneview had scored six runs in the second inning, three more in the third and then eight runs in the fourth. Bryce Ratliff, Atkins and Katie Caraway were a combined 9-for-13 at the plate, with Caraway knocking a team-high four runs in. Kaitlin Hinkle and MacKenna Reno, the team’s No. 8 and 9 batters in the lineup, were both 3-for-3. 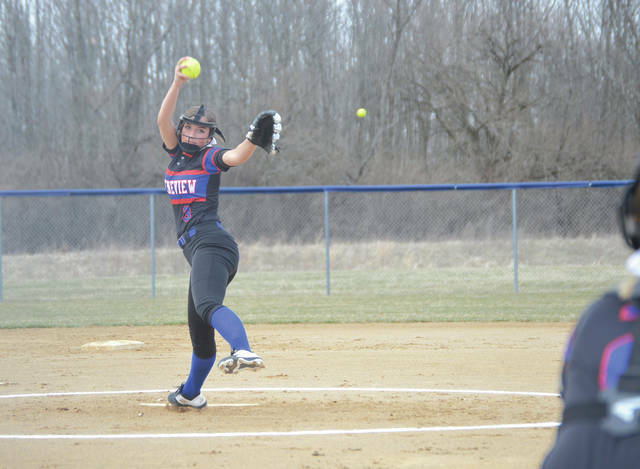 Greeneview starting pitcher Alexa Simpson struck out seven Cedarville batters, walked one and yielded seven hits over five innings of work to earn the win. 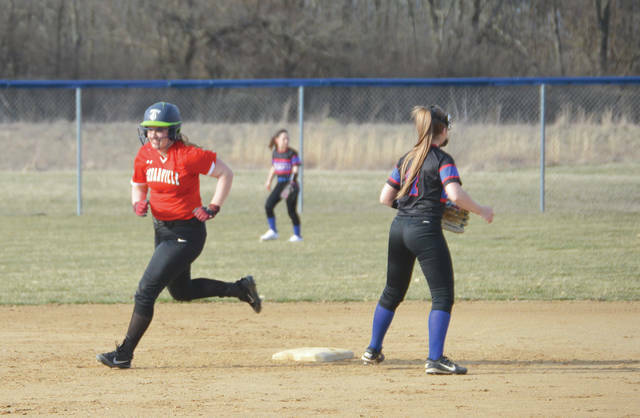 Even though they were down by 17 runs at the time, Cedarville showed its tenacity in the fifth when Whitaker, Sizer, Jacobs and Coffey combined to hit four successive singles. Coffey’s single to deep center scored both Whitaker and Sizer with the Indians final two runs of the contest. Cedarville gets to play its first home game of the season at 5 p.m. Monday, April 1 against South Charleston Southeastern. Greeneview is also playing its next game on April 1st. The Rams head to Springfield to take on Catholic Central for a 5 p.m. OHC contest. Records: Greeneview 1-2 (1-0 Ohio Heritage Conference); Cedarville 0-1 (0-1 OHC).